Anti-seizure medications (also known as anticonvulsants) were originally developed for epilepsy. Research into these drugs has resulted in them being used for a range of other conditions, including the treatment of migraine, bipolar disorder, nerve pain and pain in fibromyalgia syndrome. Anti-seizure medications seem to act in fibromyalgia by reducing or increasing the effect of neurotransmitters (the chemicals that pass information between nerves). Lyrica (pregabalin) was the first drug in the USA specifically approved for the treatment of the pain in fibromyalgia syndrome. Pfizer originally developed Lyrica for the treatment of epilepsy, and for the treatment of nerve pain in diabetes (diabetic neuropathy) and shingles (post-herpetic pain). In studies, Lyrica reduced the pain associated with fibromyalgia syndrome, improved sleep and reduced fatigue. Some people may get side effects when taking Lyrica – these may include feeling sleepy or dizzy, blurred vision, increased weight, problems with concentrating, swelling hands and feet, and dry mouth. While Lyrica is available in the USA and Europe for the treatment of nerve pain, it is currently only available in the USA for fibromyalgia syndrome. 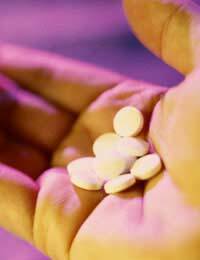 Pfizer plans to seek approval to market Lyrica in Europe for fibromyalgia syndrome. Lyrica appears to act by reducing the levels of the neurotransmitters glutamate, noradrenaline and substance P (see ‘What Causes Fibromyalgia Syndrome?’). In June 2008, Cymbalta (duloxetine hydrochloride) was approved in the USA for the treatment of fibromyalgia syndrome pain. Eli Lilly developed Cymbalta for anxiety and depression, and pain associated with diabetic peripheral neuropathy. In studies, Cymbalta improved pain and tender points in fibromyalgia syndrome, with improvements in depression and quality of life, and was safe in these patients. It significantly reduced pain in more than half of the women with fibromyalgia syndrome, but had little effect on the men in the study. Some people may get side effects with Cymbalta – these may include feeling sick or sleepy, lack of appetite, dry mouth, constipation and sweatiness. There may be a risk of suicidal thoughts in patients who are depressed. Eli Lilly applied to get approval for Cymbalta in Europe but its application was turned down in October 2008. Cymbalta’s mechanism of action is not completely clear, but it appears to work by increasing the activity of the neurotransmitters serotonin and norepinephrine, which are involved in pain messages. Some patients show a reduction in serotonin levels (see ‘What Causes Fibromyalgia Syndrome?’). Been on these drugs to. I was on a concoxtion of drugs,one cured one thing but gave you something else. I slept most days,head didnt want to function either. The problem with taking drugs is that the drs dont tell you that they can have adverse effects on the other part of your organs. The drugs also only work short term as the body builds up an immunity to them. So they are no means of a long term solution. Drugs dont work.